Online entry will open April 1. You can enter at the show! 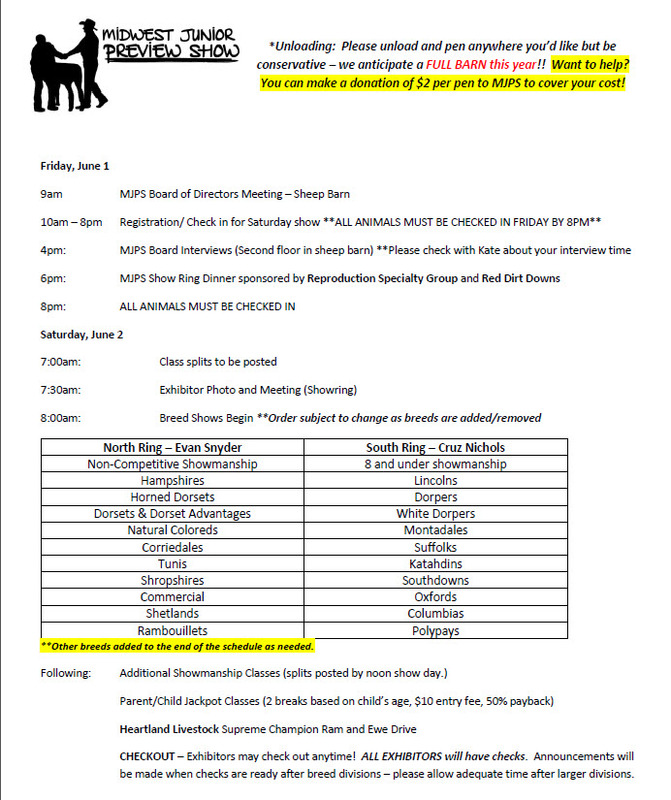 All sheep must be checked in by Friday, May 31 at 8pm, even if you preregister. Sheep can be entered in person by exhibitors or family/friends that are present or over the phones between 10am and 8pm on Friday, June 1. Please call 636-295-6015 to make phone entries. This change will help us get more accurate class splits and get those splits announced earlier! The Midwest Junior Preview Show is an annual breeding sheep show opened to all registered breeds of sheep as well as commercial breeding sheep! The show was previously located in Chillicothe, Missouri at the Litton Agri-Science Learning Center, but due to the growth of the event, in 2013 we made the move to the Missouri State Fairgrounds! Each year the show has successfully handed out over $5,000 in cash awards to young sheep breeders from all over the county! Last year's event hosted over 500 sheep and over $15,000 in premiums were awarded! The show has been designed to be a laid back, fun and educational day for everyone involved from the newest showman to the experienced shepherd! Families are invited to join us in in Sedalia, MO for the 9th annual show from Thursday - Sunday. However, sheep and exhibitors do not have to be in place any longer than Saturday during their shows. You and your family are free to come and go as necessary! Donate online using the button below! Please consider adding an extra $1 per $25 donated to cover our cost in accepting online payment. This ensures 100% of your donation will be paid to the kids. If the $1 is not added, your donation will be reduced by $1 per $25 to cover the paypal fees. Please include the form below with your doantion.